Mike McQueary is creating quite a shitshow. McQueary, a former Penn State assistant football coach, provided the testimony that led to perjury charges against two university officials, which, in turn led to the firing of Joe Paterno. Last November, less than two weeks after the grand jury issued its findings, McQueary told friends in an email he had stopped Jerry Sandusky when he saw Sandusky abusing a boy in a Penn State football building shower, and that he had also gone to the police. The latter part of that account does not square with records of both the university police and the State College (Pa.) PD, while the former portion is not supported by the account of a family friend who relayed to the grand jury what McQueary supposedly told him on the night of the alleged incident. Now, this: According to Sara Ganim of the Patriot-News of Harrisburg (Pa.), it seems McQueary didn't know exactly what year the incident he said he witnessed took place. The date in question—both from the grand jury report and from McQueary's subsequent testimony at a preliminary hearing in December—zeroes in on March 1, 2002. But yesterday, prosecutors filed documents that say—what do you know?—there is new evidence that indicates the incident happened on Feb. 9, 2001. 1. According to lawyers for Tim Curley, Penn State's on-leave athletic director, and Gary Schultz, the school's former senior vice president of business and finance, that date would put the incident beyond the statute of limitations for the charges of failure to report abuse against both men. 2. 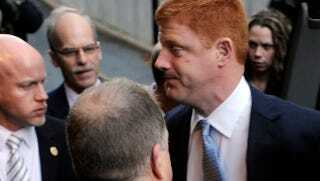 McQueary's credibility is now further undermined. Or, as Sandusky's attorney, Lawyerin' Joe Amendola, told Ganim before the case's presiding judge issued a gag order last month: "I don't know if it's a lie as opposed to faulty memory, and if it's faulty memory, what else has he misremembered?" 3. Both Curley and Schultz are also charged with perjury for allegedly lying to the grand jury as part of an apparent coverup. But with McQueary as the sole witness prepared to testify against them (so far as we know), that perjury case just became that much more difficult to prove.